Drive out to the resort and meet the elephants after a small introduction. 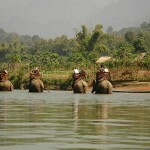 Enjoy normal elephants riding tour with an explanation about elephant information by mahouts. 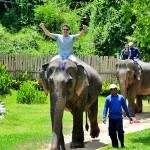 Then, take another elephant riding tour with a training how to sit in the neck of an elephant. After that, learn how to walk with the elephants, and how to communicate with them to tell them to turn left, turn right and stop and so on. In the afternoon, bring the elephants back from the camp to the forest to feed them. Then, chain the elephants in the forest, so that they can find enough food. Also you might have sometimes spending with the new elephant baby. The afternoon (after 16.00 hr) is your free time to spend at leisure in the beautiful natural lodge. Have dinner in local Lao style at the veranda with the mountain views. Wake up at early morning and walk to get the elephants. Optionally for those of you who feel too sleepy, you can meet the elephants at the river for some bathing and swimming with the animals (if water is too high and too dangerous, this activity might not be possible all year round). After washing, bring the elephants to the camp. Then, have breakfast at the camp. 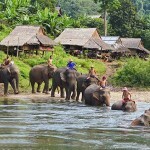 The Elephant Park Project is located on the banks of the Khan River, 15km from Luang Phabang in Laos. 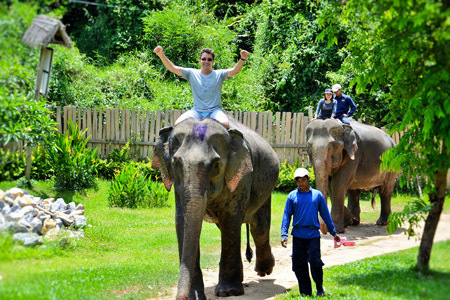 The areas within the park are accessible by elephant rides managed by experienced mahouts. Travelers visiting and staying here will have an opportunity to learn about and get close to elephants, take hiking, biking through jungles or take boat journey, rafting or kayaking, and explore exotic and traditional living of local people in the villages through homestay. 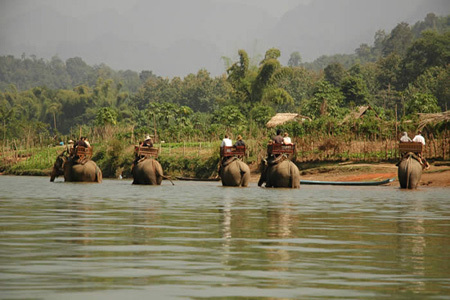 Historically, despite having been known as the ‘land of a million elephants’, Laos is gradually losing its biggest and most regal animals to human development. The Elephant Park Project is therefore established to conserve the elephant population in Laos and this project is investing in community-based eco-programmes in Luang Prabang to give Lao Elephants a new home. And as the result of losing more forests, the elephants which used to work there, logging trees, can become neglected. The experienced mahouts in the project give hands to help the elephants adapt to their new environment. Sick or older elephants are given special attention. The Elephant Park Project plans to expand its refuge to more elephants. Younger animals will learn their eco-tourism skills at an Elephant Training Centre, and an Elephant Information House will explain to visitors how traditional technology can transform dung into bio-gas, fertilizer and natural hand-made paper. The project does protect not only the Asian elephants but also support the communities around the park, through the eco- tour activities. Guides, cooks, mahouts, and maintenance staff from the surrounding villages work at the Elephant Park, which also funded construction of the local water supply. The package is possible with 2 – 4 persons and GREAT with kids as well. 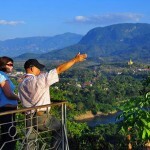 (1) One – day trekking tour (2 loops are possible: 5 hours or 6 – 7 hours). Both loops are in the fair trek area and your payment and entrance fee will support seven villages. 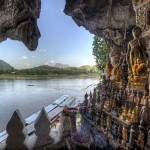 (2) One- day kayaking tour on Nam Kha River (approximately 3-4 hours). The tour needs only a soft river experience on single or double kayak. The accommodation is in the newly restored 100 year -old Elephant Lodge building, with nicely furnished apartment rooms with bathroom and veranda with view overlooking the Nam Khan River. You can upgrade the overnight sleep in the bungalows for USD 20 per person.